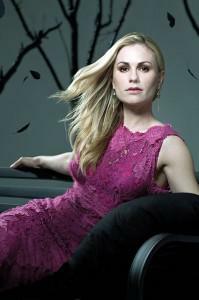 True Blood’s Anna Paquin talks to khaleejtimes.com where she talks about her career and the difference about working in TV vs. film. Anna also talks about True Blood and being directed by Bill Compton, otherwise known as her hubby, Stephen Moyer. Fortunately Paquin can talk more about other things to come on True Blood, both for the show in general and for Sookie specifically. That’s why the actress, who will turn 30 in July and is pregnant with her first child by husband/co-star Stephen Moyer, is on the telephone from her home in Los Angeles. “Sookie has quite purposefully unattached herself from her various gentlemen and is going to try to go it alone, be independent and take care of herself,” Paquin says. “Obviously, because it’s True Blood and because she’s Sookie, danger kind of follows her around, so things don’t necessarily go as well as planned. Also memorable for Paquin, albeit for a decidedly personal reason, was the season’s eighth episode, ‘Somebody That I Used to Know.’ It was directed by Moyer, the first time he’s tackled that task. Was it at all weird to be taking direction from her husband? Back in 2008 Paquin arrived on the True Blood set unsure of what to expect. She had spent her career in features, winning an Oscar as Best Supporting Actress at 11 for her work in The Piano (1993) and subsequently appearing in such films as Jane Eyre (1996) and X-Men (2000). However, playing a single character in a single project that lasted for weeks, months and, as it has turned out, years was a brand-new experience for her.